70208-0015, 70330-0016, 70606-0002, 70614-0007, 71203-0004, 71204-0006, 71205-0009 (see above), 80421-0009, 80717-0016, 80717-0021. Alberta Education is a non-profit Alberta Provincial Government Department in Edmonton, Alberta, Canada. One of the many responsibilities of the Ministry is to supply support material that help teachers engage their Kindergarten to Grade 12 students by giving them a variety of ways to learn. The aim of the project is that students can make the most out of their learning. Through an examination of Japan, students will demonstrate an understanding and appreciation of the ways in which beliefs, values and knowledge shape worldviews and contribute to a society’s isolation or adaptation. For this purpose, Alberta Education was looking for representative old images of Japan. They found ten of them at meijishowa. At meijishowa, we aim to offer more. 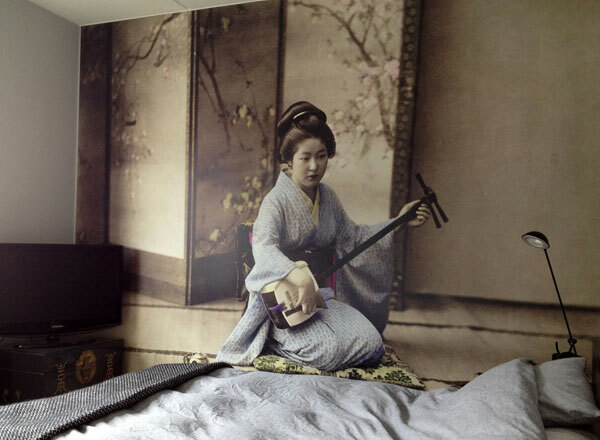 A private client in Sweden wanted to cover a wall in his bedroom using one of the meijishowa images. The wall measured 3.20 meters wide by 2.55 meters high. Such a large print required an extremely big file, so meijishowa made a special scan for this client. The 820 MB file was printed by an experienced printer in Sweden. We are so pleased with the result. The image is magical and when we mounted it on the wall there was a 3D effect which gave the picture an incredible depth and life. Domaine de Boisbuchet, based at an old and slightly dilapidated castle in the countryside of France, offers international summer workshops led by renowned designers, architects and artists. 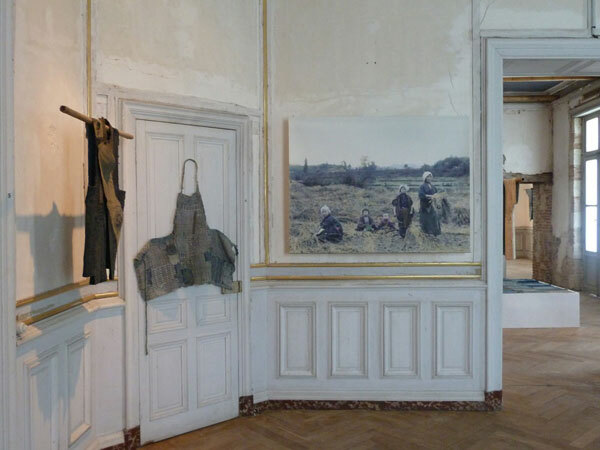 In 2013, it organized an impressive exhibition on boro, the clothing worn by peasants, merchants and artisans in Japan from the 17th to the 19th century. The clothes were hung on cracked walls or suspended in the air on thick bamboo poles. 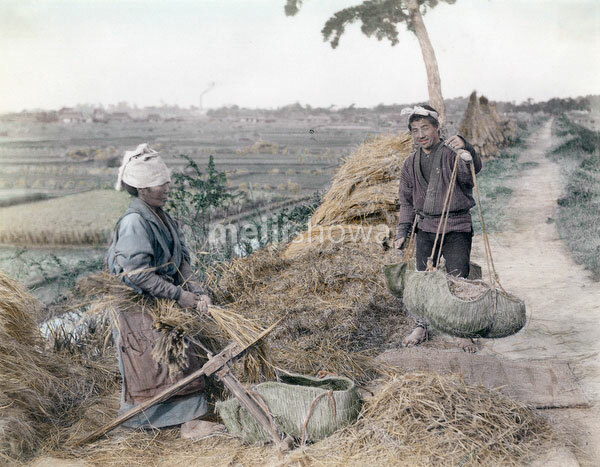 In between, two MeijiShowa photographs showed the clothes in action on the backs of hardworking peasants. Boro – The Fabric of Life was organized and produced in a very short time frame. When the organizers discovered that authentic photos of Japanese rural life between 1850 and 1950 were hard to find, time pressure mounted. At meijishowa however, they found a large collection at a level of quality that matched their high requirements. The National Museum of Ethnology, located in the historical Dutch city of Leiden, was established in 1837. The museum is famous for its large collection of Japanese artifacts, but it also holds a large number of objects from Africa, the Americas, Oceania, and other countries in Asia. 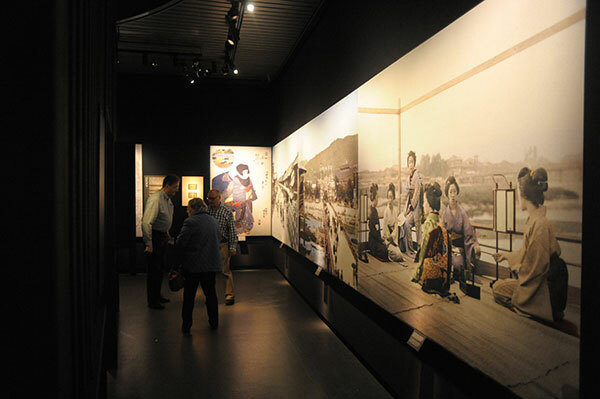 From 2014 through 2015, the museum held a large exhibition about the history and modern situation of Japanese Geisha. The exhibition became the most popular in the museum’s history and attracted a record number of visitors. Several meijishowa photographs were specially scanned for this exhibition and reproduced at large formats on textile. They were beautifully lit and became one of the highlights of the exhibition.